One robotics team catches a “hazardous” liquid in an orange bucket while maneuvering around debris and working with another robot trying to stop the leak by turning three valves during the 2017 Robot Rodeo at Sandia National Laboratories. (Photo by Norm Johnson) Click on the thumbnail for a high-resolution image. 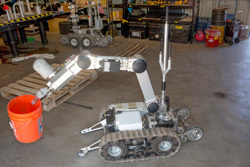 ALBUQUERQUE, N.M. — For a dozen years, robotics experts from the national laboratories have shared their skill with first responders who use robots for hazardous tasks by coordinating annual training competitions to help prepare them for dangerous real-world situations. 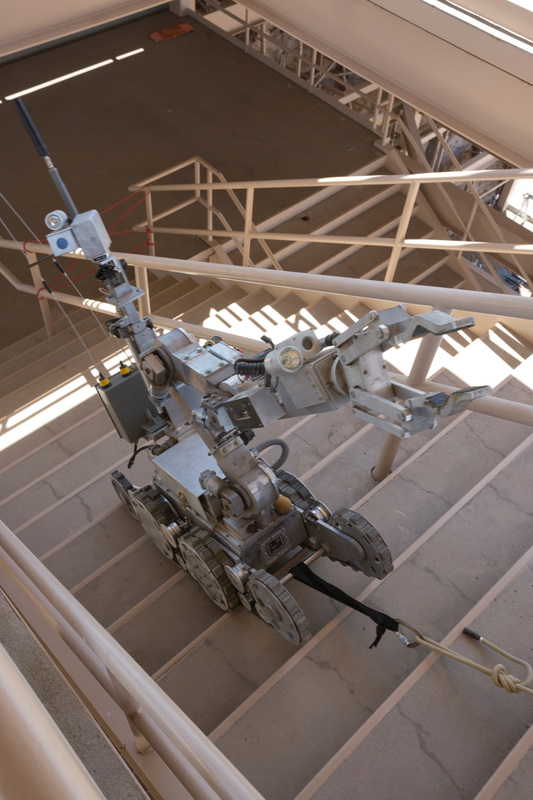 Next week, Sandia National Laboratories will host the 12th annual Western National Robot Rodeo, a weeklong, 11-event competition where 10 civilian and military bomb squad teams from around the region will solve challenging, simulated scenarios. Scenarios from last year included “What a Mess,” in which teams had to use their robots to stop a “hazardous” leak in an area too dangerous for humans to enter and “Stairway to Heaven,” which involved the robots having to climb flights of stairs and solve dexterity challenges on each level. This year, two scenarios are “Red Dawn,” like the movie, and “Water Park.” Imagine what these scenarios may entail as the participants certainly are. A hazardous duty robot climbs the second of three flights of stairs during the 2017 Robot Rodeo at Sandia National Laboratories. The safety line catches the robot if it falls, ensuring it doesn’t get damaged. (Photo by Norm Johnson) Click on the thumbnail for a high-resolution image. Instructors from the FBI’s Hazardous Devices School will run several events and sponsors from the Department of Energy Office of Environmental Management will observe this year’s competition. For the first time, Sandia is hosting a robotics camp for local high school students the same week. The students will play an important role in one of the Robot Rodeo scenarios. Military Explosive Ordnance Disposal teams scheduled to participate include the defending champions, the Army’s 21st EOD Company, along with an Air Force EOD team, a Marine Corps EOD team and an Air National Guard EOD team. Civilian bomb squad teams scheduled to participate include police departments from Albuquerque, Farmington and Los Alamos, the Doña Ana County Sherriff’s Office, the New Mexico State Police and the Riverside County Sheriff’s Office from California.